This is an intelligent, well-informed, inclusive, inspirational, rirgorous book of hope. Many of us believe that we are going to hell in a handcart (climate change, political ineptitude, ‘othering’, lack of leadership) but this wonderful pellucid work emphasises that things are indeed better for many (see also Rosling), but at a considerable cost. The arguments on the paucity of GDP as an intelligent way to measure ‘progress’ are unassailable and they offer a range of other metrics but they are also really clear on both the diminishing benefits of continued growth on a finite planet and indeed the associated but often not counted costs (environment, mental health, fragmentation). Jeremy and Katherine are thinkers and writers pointing a new way which balances Useful and Kind solutions for Self, Others and the World, showing that when we understand that we have enough then ‘arriving home’ is actually a much ‘richer’ and healthier way to be. 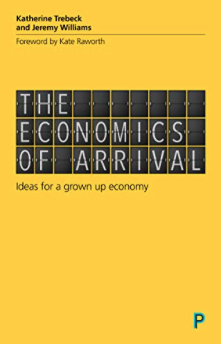 Buy this book and send it to someone who can use it, be they Chancellor of the Exchequer or the young start-up social entrepreneur down the road - they can all learn from it. Fraser D Give me the Child and I’ll Give You the Leader . What can Attachment Theory Teach us About Leadership? Leadership Journal The International Journal of Leadership in Public Services Volume 3 Issue 3 October 2007© Pavilion Journals (Brighton) Ltd 42,Perspectives on Leadership.